2Oth.—At Majuro early in the morning, a pearl of atolls. The lagoon, large and round, but not so large that we cannot distinctly follow the coastline. At the entrance it is broken into the most enchanting small islets, all very green and soft, the lagoon clear and in colour like a chrysoprase. Mr. Henderson offered us a little house on the windward side, so we took our mats and blankets and a lantern with us in the boat. The house was the old "lookout" consisting of a single room with latticework running along two sides of the wall under the roof; this lattice served for windows. The door had a padlock so we could lock it as we came and went. I had taken my paints with me and made a little portrait of a native girl called "Topsy" by her white husband. She was a very small, very thin creature, greatly given to dress. She seemed to live with several other women in a sort of boatbuilders' shed, where I would always find her, her thick hair shining with oil and carefully braided, a different head-dress for a different hour—her keys hanging below her rows of necklaces, busily employed at something or other; sometimes it was a necklace she was stringing on shreds of pandanus leaves, sometimes a new print gown she was cutting out with a most capable, businesslike air; or she might be feeding her monkey ("monkaia," she called it) or her gentle-eyed dog; or, most interesting task of all, sorting her possessions into order. 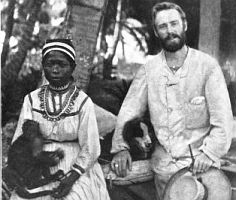 "Topsy," with monkey, dog, and white trader husband, Majuro Island. It seems that she was a castaway from another island, every other soul in the canoe being lost. She was absolutely ignorant, and when something was said about her heart, gravely assured us that she had no heart, being solid meat all through. Topsy sat for her portrait most conscientiously as though it were a photograph, not moving a hair's breadth, nor hardly winking. After each sitting she returned to exactly the same position. I tried in vain to make her take it more easily; when I talked to her (she knew half a dozen words of English) she responded with stiff lips, trying to speak without moving them. I took her a wreath which delighted her, and just before we left I came across a red silk bodice with a smocked yoke and embroidered cuffs; just the thing, I felt, for Topsy. The captain, Louis, and Lloyd were with me when I gave it to her. She instantly slipped off her upper garments, showing a very pretty little figure, and we all together robed her in the bodice. Topsy is quite a great lady with her female attendants, living in her boat-house, sleeping on her mat beside her two chests with her dog, and that rich possession the "monkaia." Some one the captain knew took a large monkey to Savage Island, but the people would not allow it to remain; it was, they said, derogatory to their dignity. *Fresh palm toddy tastes like sweet champagne and is very wholesome; sour or fermented toddy is quite another thing. At dawn on March 1, a Marine corporal on lonely Kwajalein saw an awesome sight. "All of a sudden," he wrote his mother, "the sky lighted up, a bright orange, and remained that way for what seemed like a couple of minutes . . . We heard very loud rumblings that sounded like thunder. Then the whole barracks began shaking as if there had been an earthquake. This was followed by a very high wind." In another letter, two days later, the corporal reported that two U.S. destroyers pulled into Kwajalein with victims of atomic radiation. Man's Greatest Explosion. What the corporal saw and reported from his own perch was the result of the biggest explosion ever set off by man [Operation Castle, Test Bravo]. It happened several hundred miles away from Kwajalein, somewhere in the U.S. proving ground in the Marshall Islands. In a precautionary rehearsal of a formal test shot from an Air Force bomber that will take place sometime in the next two weeks, U.S. scientists had exploded a thermonuclear device atop a tower. The force of the blast completely surprised them. Calculations of the explosion's energy and effect are incomplete [the actual yield was later estimated to be 15 megatons; now the 7th largest explosion in history], but they were so great that the Atomic Energy Commission was forced to reclassify the previous tower shot (Nov. 1, 1952) as a misfire. • Its fireball measured 28 miles in diameter. • Its force was calculated at five megatons, i.e., equal to 5,000,000 tons of TNT or 250 times the force of the Hiroshima atomic bomb [this estimate was later revised to over 10 megatons]. • Its mushroom cloud climbed 90,000 feet, into the stratosphere, and a fast transport plane carrying an Air Force general and an Atomic Energy Commissioner at 30,000 ft., 50 miles away, had to turn and run to avoid being caught under the lip of the mushroom. A String of Salutes. The test of last fortnight makes all its predecessors, including the 1952 shot, look like a string of one-inch salutes. The force of the explosion probably exceeded ten megatons (500 Hiroshimas). It sent a radioactive cloud billowing to a height that may have exceeded 20 miles. In the thin air of the stratosphere, it seems likely, the cloud slumped over like water tossed from a bucket. 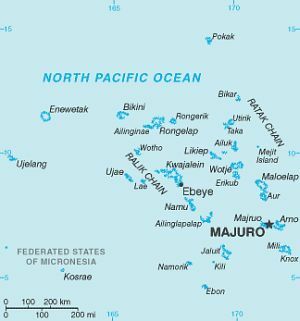 Twenty-eight U.S. observers and 236 natives of local islands had been evacuated to what had been considered a completely safe refuge, but the unpredicted "fall-out" showered them with radioactive particles. Their exposure to radiation was ten times greater than scientists deem safe, but the AEC was reassuring. "There were no burns," said a commission announcement. "All are reported well. After completion of the atomic tests, they will be returned to their homes." The 1954 blast upset plans for the formal test shot, which will be witnessed by the AEC, the Joint Congressional Atomic Energy Committee, and Dr. Edward Teller, the scientist principally responsible for the thermonuclear weapon. While scientists feverishly recalculated their data and tried to explain the unexpected force of the big blast, the formal test was postponed a few days. That test, in which a thermonuclear device will be dropped from the bays of a B-36 on the shrouds of a huge parachute (to give the plane time to get out of the way), is expected to duplicate the March 1 explosion. The prospect sobered the Government officials who will witness the shot. Last week, as he prepared to leave for the Pacific, AEC Chairman Lewis Strauss said goodbye to a reporter: "I'll see you when I get back—if I get back." 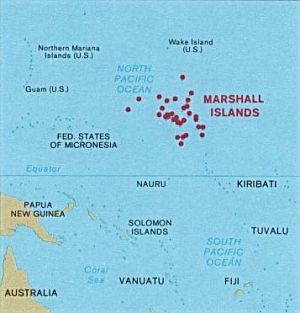 After almost four decades under US administration as the easternmost part of the UN Trust Territory of the Pacific Islands, the Marshall Islands attained independence in 1986 under a Compact of Free Association. 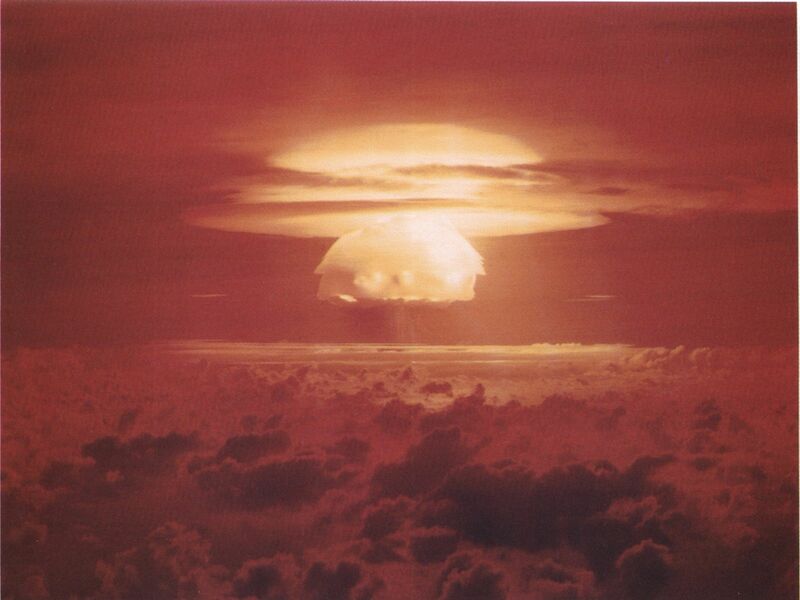 Compensation claims continue as a result of US nuclear testing on some of the atolls between 1947 and 1962. The Marshall Islands hosts the US Army Kwajalein Atoll (USAKA) Reagan Missile Test Site, a key installation in the US missile defense network. Embassy of Marshall Islands, Washington D.C.
An aerial view of the March 1, 1954 Castle Bravo 15 megaton nuclear test at Bikini Atoll. How dangerous is radioactive fallout? At last week's Atlantic City meeting of the American Medical Association. Commander Robert A. Conrad of the Naval Medical Research Institute reported on the Marshall Islanders who were exposed to moderate fallout from the great test explosion in the Pacific on March 1. 1954. Talking to physicians, he did not prettify. 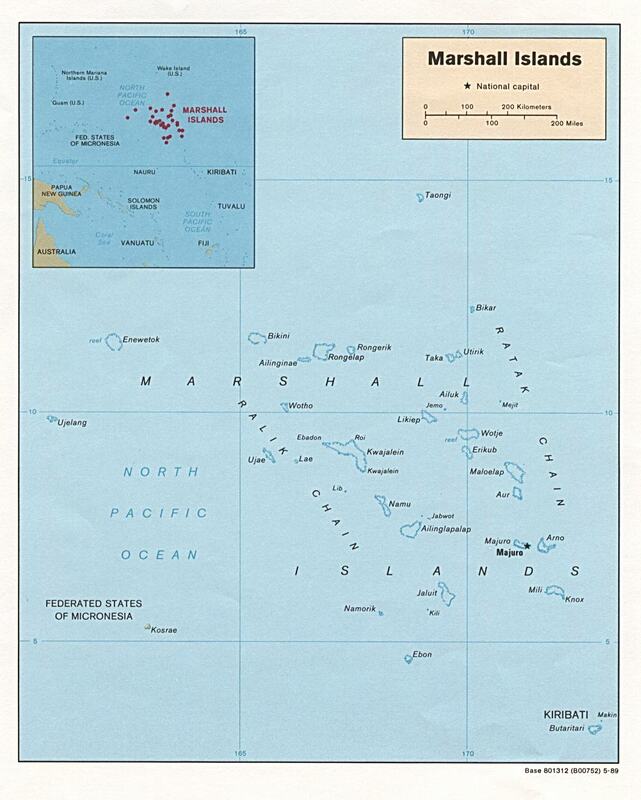 The most intensive study was made of 64 Marshallese whose island got the heaviest fallout. Hours after the detonation. a snowlike material fell from the sky. It whitened their hair and clung to their skins. At first it had no ill effect, but during the night and the next day or two, about three-fourths of the people felt nausea. Their skins itched or burned, and tears ran from their eyes. After two days the Navy took them all to Kwajalein Island and made vigorous efforts to decontaminate them. By this time their first symptoms were gone. Calculations showed that they had received about 175 roentgens [röntgens] of radiation, which is less than half of a deadly dose (400 R). But they were watched carefully. A fortnight later, new symptoms began to show. The patients' dark skins grew darker in patches and rose up in leathery plaques. Sometimes the skin peeled away, leaving white or pink tissue. Deeper burns wept and formed crusts. When burns were on the scalp (70% of all individuals), the hair came out by the handful. Tended by squads of Navy doctors, the burns healed eventually, leaving only scars or patches of discoloration. More long-lasting were the effects on the islanders' blood. The lymphocytes (one type of white blood cell) were reduced by more than 50%, and most of the effects lasted for six months at least. The children were hardest hit, but devoted care kept all of them alive. The Navy concluded that most of the external damage came from the dust on the islanders' skins and in their hair. More clothing, better shelter and prompt decontamination would have reduced it. None of the Marshallese died. Fatal internal damage was prevented by removing them from their contaminated island—just in time. Probably 50 more roentgens would have killed at least some of them. A distasteful job of Atomic Energy Commission officials is to tell Americans what to do if a similar bomb should contaminate a part of the U.S. Instructions prepared by AECommissioner Willard F. Libby contain little cheer. A ten-megaton bomb (equivalent in energy to 10 million tons of TNT), says Libby, creates 1,100 Ibs. of radioactive fission products. Airborne for one day and then spread evenly over an area of 100,000 square miles, it would give each unsheltered person a dose of 67 roentgens per day. This is not far from the strength of the "snow" that fell on the Marshall Islanders. * They survived because they were evacuated promptly and cared for well, but as Libby remarks in an understatement, evacuation of 100,000 square miles (more than twice the size of New York State) "may be a bit impractical." Dr. Libby recommends that everybody stay indoors, preferably in a basement, where radioactivity will probably be low. Finding the coast reasonably clear, people should get to work at the heavy labor of decontamination. Fire hoses will do a lot of good (if there is water), and shielded street-sweeping machines (not yet devised) will brush the contaminated asphalt. Heavy rain (if rain falls) will carry some of the deadly dust down the rivers to the sea. At last the interdict will be raised, and people can go about their ordinary business, avoiding dangerous areas and conscious that even in the safer places they are still receiving a considerable input of Rs. To judge by the Navy's experience, many of the worst effects will not appear for weeks. The number of deaths, near-deaths and disfigurements will depend on how well the people have avoided radiation and have decontaminated themselves, and on how promptly they-have received good medical care. *In practice, some places would get much more radioactivity, perhaps an amount quickly fatal in spite of precautions. Others would get less. Rising sea levels due to global warming are a threat to the Marshall Islands and other low atolls. This photo from the Marshall Islands Journal was taken by Murray Ford near the airport at Majuro.